In 2013, the violence from Syrian rebel groups was at an all time high, and military bases were being captured at an alarming rate. The Government of Jordan was working to stregthen border patrol in order to secure their country lines, keeping Syrian Rebels out and civillians safe. The United Nations Operations for Project Services (UNOPS) also had goals for ceasefire and funded projects in Jordan to help with border security. In doing so, UNOPS issued an urgent request to eligible vendors on order to acquire Military-Style Motorcycles for the Border Patrol Enforement. American Procurement Services (APSCO) responded to their tender and was awarded the contract due to their quick delivery times and competitive pricing. APSCO accepted the challenge and performed the sourcing, acquisition, and delivery of 42 Military Police Motorcycles to the Jordanian Government, under UNOPS’s contract, within 60 days. 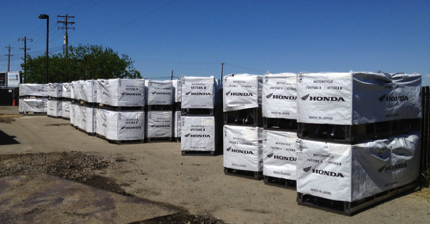 American Procurement Services’s original supplier, Honda-UK, was unable to complete the order request for 42 motorcycles with such a short delivery timeline of 6 – 8 weeks, therefore APSCO’s team had to source the motorcycles from multiple Honda Dealers in the US. After several days of negotiations with US dealers, an agreement between Honda and APSCO was made, while still being able to meet the deadline. APSCO’s contract team was able to work with Honda and successfully consilodated all motorcycles at the Oakland, California seaport. 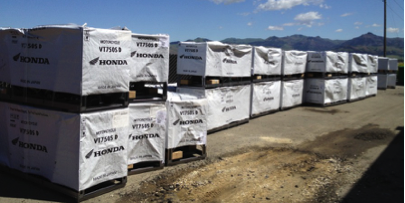 Within 45 days, all 42 new Honda VT750C Shadow Aero Motorcycles, were packed for export and ready to ship. All motorcycles were secured in crates for airfreight out of Oakland, California and ready for use upon arrival for the Jordanian Border Patrol. APSCO’s worked with logistics company, Kuehne and Nagel, who were able to find available cargo aircrafts on short notice, and the equipment was delivered ahead of schedule.